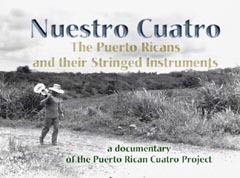 The video is in distribution and available for purchase from the Cuatro Project web site. It has been shown at numerous festivals, including the Festival of American Folklife at the Smithsonian, Washington DC. is a product of the collective conviction of all its participants that culture  especially musical culture  builds community. Cultural education is a powerful tool that furthers community development and health. Culture creates vision among people, creating a sense of who they are and a sense of their own history. The elements of culture thus become a source of strength and a storehouse from which people draw resiliency, hope and a sense of interconnectedness. 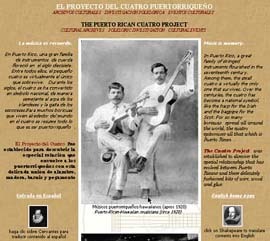 During this marvelous musical tour: from Columbus to Ramito--one that spans five centuries--we see and hear famous artisans, cuatristas, researchers and historians across the international Puerto Rican Diaspora reveal how the cuatro has been able to so powerfully move the Puerto Rican spirit.